Asia’s Got Talent Season 2 Premiering Tomorrow! Just one more day to the premiere of Asia's Got Talent Season 2 on AXN! This Thursday, October 12 on AXN in a special 2-hour episode at 8:30pm (7:30pm BKK/JKT)! 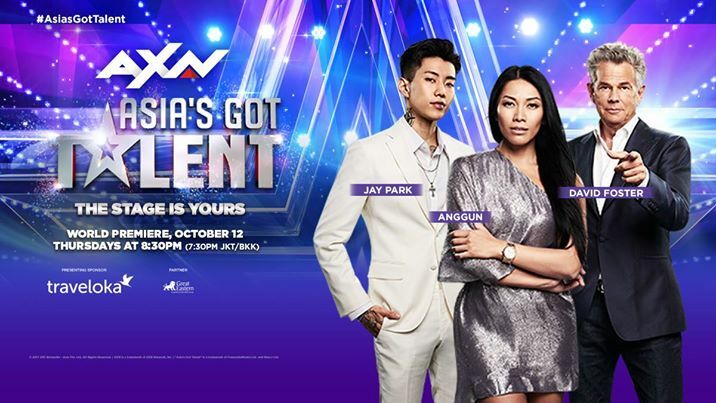 This season, viewers can expect more thrills, more surprises and a whole new generation of stars as 165 acts from 15 Asian countries compete for the USD100,000 grand prize. The judges are 16-time Grammy-award winner and music producer David Foster; internationally acclaimed singing sensation Anggun and newcomer to the series, multi-platinum recording artist Jay Park are in the hot seat to determine who goes through to the next round in the first five episodes; but it’s the audience – the ‘fourth judge’ – who will vote in the semi-final episodes to determine the ultimate winner. Adding to the series are the dynamic new hosts Alan Wong and Justin Bratton who will entertain viewers with their witty banter and spontaneity on and off the stage. Remember to subscribe to the official YouTube Channel at www.YouTube.com/AsiasGotTalent for extended highlights of Asia’s Got Talent and exclusive behind-the-scenes footages!